From time to time,Swami gives us something called a visiting card. In simple worlds, he manifests a miracle. Swami often says that miracles are for ‘nidarshana’ i.e establishing divinity and not for ‘pradarshana’ i.e exhibition. He points out the role of a miracle in the overall scheme of his plan: first chamatkar, a miracle. Then sanskar, or refinement. Next comes, paropakar, or selfless service and finally saakshaatkaar or the ultimate vision of the Divine. That is, He attracts us through the miracles, refines our hearts and minds with His teachings, and prods us along the path of selfless service which leads us to self realisation. Swami is like the doctor who gives us the visiting card. There is no use glancing at the card and praising its beauty and expressing awe at the credentials of the doctor. One has to approach him, get diagnosed, take the prescription, follow it and get cured of the disease! 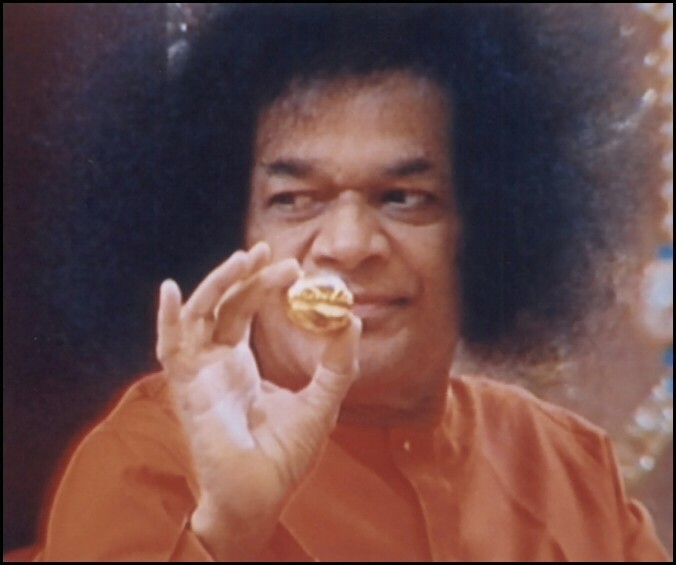 I had been told that every year, one or more Shivalingams have materialised in Sathya Sai Baba’s body at this sacred period of Shivaratri. He ejects the lingams through His mouth for all to observe. They are always hard, being made of crystal clear or coloured stone and sometimes of metals like gold or silver. At six o’clock Sai Baba, accompanied by a small group of disciples, came onto the Shanti Vedika and soon after that the speeches began. It was about eight-thirty, powerful electric lights illuminating the group on the platform, when Sai Baba rose to His feet. First He sang a sacred song in His sweet celestial voice that touches the heart. Then He began His discourse speaking, as He always does on such public occasions, in the Telugu tongue. On the platform Mr. Kasturi was busy making notes of the address which would be published later in both Telugu and English. 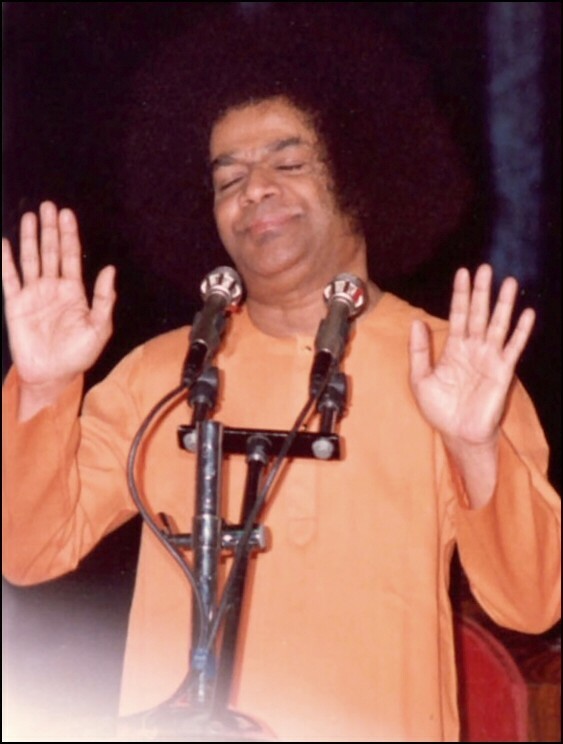 Sai Baba’s eloquence had been flowing in a steady stream for some half-hour when suddenly His voice broke. He tried again but only a husky squeak came. Bhajan leaders among the devotees, knowing what was happening, immediately gave voice to a well-known bhajan and then the great crowd joined in. Baba sat down and drank from a flask of water. Several times He tried to sing, but it was impossible. Now He began to show signs of real pain. He twisted and turned, placed His hand on His chest, buried His head in His hands, plucked at His hair. Then He sipped some more water and tried to smile reassuringly at the crowd. Some men around me were weeping unashamedly and I myself felt a flow of tenderness towards the being suffering there before us. I could not grasp the full significance of the event that caused the agony, nor perhaps could most of the great crowd watching, but to understand a thing with the mind is one matter and to feel its meaning in the bones and blood is another. Inwardly I felt that I was sitting at the very heart of something profoundly significant to mankind. So, instead of blurring my eyes with the tears of sympathy, I kept them fixed on Baba’s mouth; my whole attention was glued to that point so that I would not miss the exit of the lingam. After about twenty minutes, I was rewarded. I saw a flash of green light shoot from His mouth and with it an object, which He caught in His hands cupped below. Immediately, He held the object high between His thumb and forefinger so that all could see it. A breath of profound joy passed through the crowd. It was a beautiful green lingam, and certainly much bigger than any ordinary man could bring up through his throat. Sai Baba placed it on the top of a large torch so that the light shone through its glowing emerald-like translucency. Then, leaving it there, He retired from the scene. Reference: “Sai Baba: Man of Miracles” by Mr. Howard Murphet. Page: 43-49 (Paperback Edition). Published by Macmillan India Ltd, 1972. This amazing episode is narrated in the book “Anyatha Sharanam Nasthi – Other Than You Refuge there is None” by Smt. Vijayakumari. 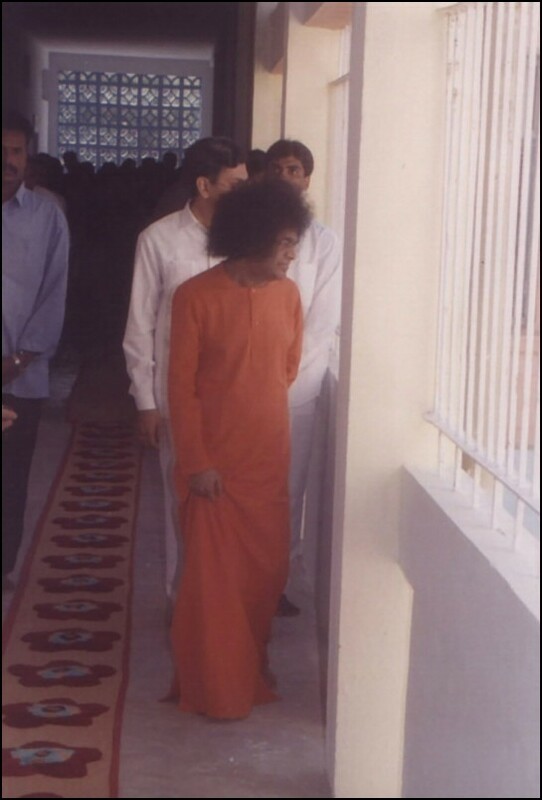 The author recounts the golden days devotees spent with Sathya Sai Baba. Those times there were only a handful of devotees in Puttaparthi and the Chitravathi sands were His playground. Even as we were thinking, “how can the sun come back after it has already set?” we saw newly rising rays behind Swami’s head. The whole sky was filled with blue clouds. The rays began to turn red till they looked fiery and exuded so much heat as to make us all sweat profusely. The rays were intensely hot as if coming from the scorching midday sun. Unable to bear the heat we all made loud appeals, “Swami! It is too hot”. The heat subsided. We were just settling down, when Swami’s voice came down to us from the top of the hill, “I shall show you the Moon”. We saw behind Swami’s head, the half-unfolded honey-coloured rays of the moon. They soon turned white – whiter and whiter still. That was that. We began shivering in the cold. Our bodies became stiff. Our teeth began to chatter. “Swami! Cold! It’s very cold, Swami!” As we were imploring Him thus, the cold slowly subsided. While we were wondering what other miracle He would perform, He announced, “I shall show you the Third Eye. Watch it very carefully and attentively”. “Third eye! How does it look?” we wondered. Swami’s body was not visible. But His head appeared gigantic, as if it were stretched across the entire sky. Stupefied, great bewilderment filling our minds, we stared at the sky. On Swami’s forehead, between His two eyebrows, an orifice appeared. Fiery, fuming sparks began to come out of the opening. Our eyes were dazzled by the brilliance of those sparks. We were scared. More than fear for ourselves, we were worried about what might be happening to Swami. The sparks continued to gush out. When we looked back, we found that many had fallen down, unconscious. We did not know what made them faint. That scared us further. We looked up, but could not find Swami anywhere. Feeling lost and not knowing what to do, we began weeping. Suddenly, we found Swami standing in our midst. “What happened?” He asked us, patting us on our shoulders. “Why are you weeping? Why have these kids fainted?” Not knowing what answer to give to these questions, we just hugged Him and continued weeping. As one or two of those who had fainted recovered and got up, we mustered a little strength and, in one voice, we all asked Him, “Swami! Are you alright? How come we did not see You there?” While asking these questions, we patted His face and body to reassure ourselves that He was really with us. Swami laughed heartily and, reassuring us that He was all right, He created Vibhuti with a wave of His hand, and He Himself put it on our foreheads. One by one, those who had fallen unconscious persons began to stir. It was a strange experience. We felt as if our bodies were moving unsteadily hither and thither. We felt as if we were floating on air. Some inexpressible joy seemed to pervade our entire being. It was some sweet surge of affection. We did not understand its nature. Though we were keeping pace with Swami, it seemed to us that our feet were not touching the ground. Some were walking unsteadily, as if drunk. We all felt we were in some other strange world. It was a peculiar state of mind. We all reached the Mandir and sat down for bhajans. We could not sing properly. We felt dizzy. That whole evening was spent in that state. When we found ourselves in a similar state the next day also, we asked Swami about it. Overwhelmed by this revelation, we all broke down and wept. We washed His lotus feet with our tears and told Him, “Swami, if only we had known this before, maybe we would have enjoyed the Darshan more. We could not fully utilize the divine boon You so kindly granted us. Really, we could not endure its profound impact. We got scared when we could not see Your physical form. We felt very anxious about You when we saw the orifice on Your forehead”. 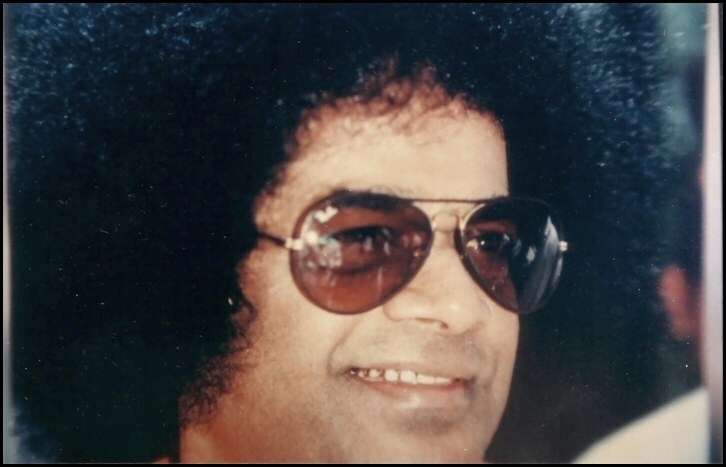 Sathya Sai Baba just continued to look at us with great compassion and love and, feeling overwhelmed by the shower of His affection soothing us like moonlight, and with tear-filled eyes, we offered our lives at His feet. 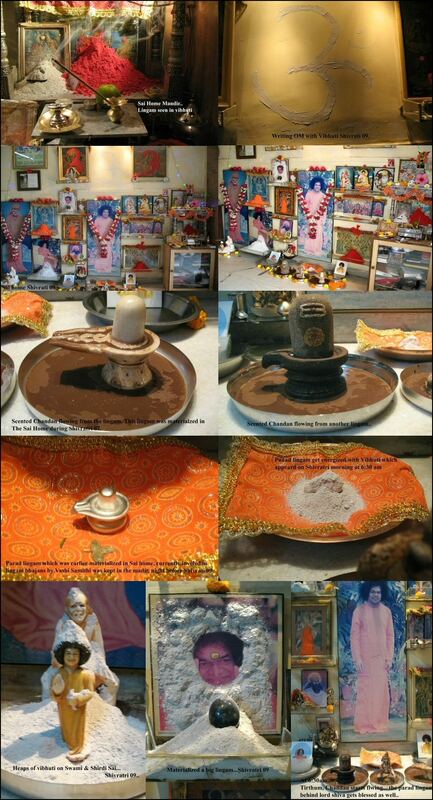 He again created Vibhuti and placed it on each of our foreheads. We gained a semblance of normalcy thereafter. We felt ecstatic inwardly, dwelling on this rare golden opportunity, this reward for some devotion in past lives, for some prayer we must have said with golden flowers, or some luck we got because of the good deeds done by our elders. Beneath the golden temples of our hearts we etched, in golden letters, what we saw was a unique vision granted to us by our good fortune, to give us liberation. More than anything else, just to be near this Loving Father, and to get a golden opportunity like this, is a significant event, a culmination of the merit of many previous lives. Reference: “Anyatha Sharanam Nasthi – Other Than you Refuge There Is None” by Smt. Vijayakumari. Page: 58-61. Published by the Author, 1999.